We are an eminent Steel Blind Rivets Manufacturer, Exporter, Importer and Trader based in India. The Steel Blind Rivets provided by us are made using high grade steel material. Our Steel Blind Rivets are of high strength with excellent load bearing capabilities. 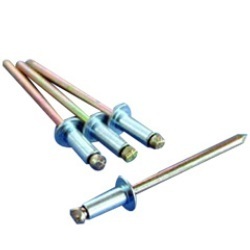 These Steel Blind Rivets provide strong and vibration resistant joints to the user application. Kalyani Sales Corporation offer steel blind rivets, which are of high strength with load bearing capabilities, providing strong, vibration resistant joints. These are used in steel fabrication, structural, sub-assemblies, framework, hinge fixing to steel frames, steel furniture and many others.